A German man disguised three Moroccan tortoises as pastries in a failed attempt to smuggle them into Germany. 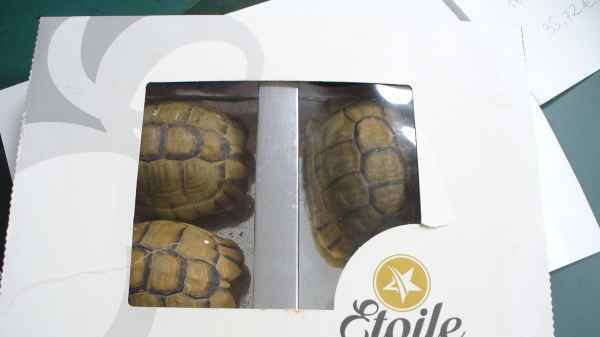 Rabat – Customs officers at Schoenefeld Airport in Berlin have caught a German man smuggling three living Moroccan tortoises inside a pastry box. The officers confiscated the animals and placed them in veterinary care in accordance with the Convention on International Trade in Endangered Species of Wild Fauna and Flora (CITES). The tortoises are protected under the multilateral treaty to protect endangered plants and animals. If charged with breaking international species protection law, the 69-year-old man risks a fine of up to €50,000 and up to five years in jail, according to a statement released by Schoenefeld Airport last week. Recently, the Spanish civil guard arrested a woman from Equatorial Guinea arriving in Spain from Morocco with five dead animals in her suitcase, four porcupines and one pangolin. The woman hid the animals in her luggage without any documentation. The pangolin, the world’s most trafficked animal, is critically endangered and is listed under CITES. The Spanish police found the animals while screening the luggage of passengers on a flight from Casablanca.